Habla! is your Pr? 's on the go dictionary for Spanish. Habla! is powered by SpanishDict.com, and provides you with a robust dictionary to help you figure out what it is that you want to say. Habla! Is bidirectional, meaning that you can search for either an English or Spanish word. In the application menu, Habla! 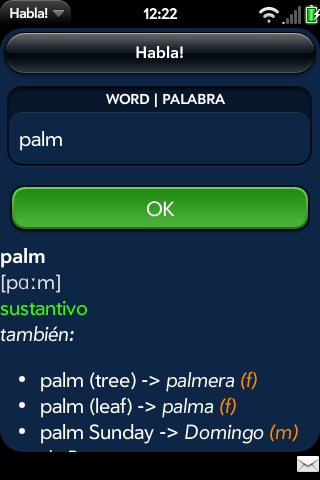 also has a Word of the Day feature to ensure that you're constantly adding to your Spanish vocabulary. Download Habla! and improve your Spanish pronto! !